Summertime does some THANGS to my hair, y’all. The sizzling hot weather turns my coils into frizz so dense I could lose my wedding ring in the roots of my hair. My scalp gets to feeling hot and sweaty and icky. I get buildup and flakes. If ever there were a time to switch up my regimen, it’s in these dog days of summer. When my hair gets to that point of maximum density, I need a shampoo and conditioner combo that can cleanse my grimy scalp while restoring my hair to a feeling of touchability. Right now my go-to favorite shampoo and conditioner for when the natural hair going gets rough — Shea Moisture’s African Black Soap Deep Cleansing Shampoo and Balancing Conditioner. Shea Moisture has a whole product line of black soap items — there’s the shampoo and conditioner, the dandruff and dry scalp elixir, and three bodycare items including a bar soap, a liquid soap, and a moisturizer. 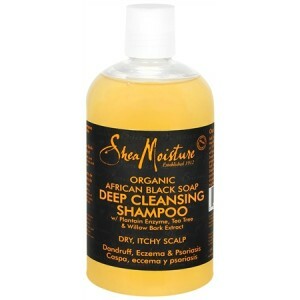 So far I’ve tried Shea Moisture’s black soap haircare items, as well as their body wash and body moisturizer. All of them are great. And for those of you who aren’t familiar with black soap and its cleansing capabilities, I went to the Shea Moisture source. “Our African Black Soap products are based on a recipe handed down from my grandmother, Sofi, who proudly made and sold it in Sierra Leone. It has been used for centuries to naturally exfoliate skin, lighten dark spots and hyperpigmentation, relieve eczema, psoriasis and dandruff, and help heal acne and breakouts. At SheaMoisture we refer to African Black Soap as being the “cure-all”, because it does what sometimes even harsh chemically-based and prescriptions strength products can’t do — help relieve and heal many skin and scalp conditions gently and all-naturally,” said Founder and CEO of SheaMoisture, Richelieu Dennis. In the past I’ve bought black soap from street vendors (shout out to Harlem, 125th Street is where it’s at!). The black soap I’ve bought in the past has been crumbly and sold in tubs, or as smooth black bars of soap. Shea Moisture’s shampoo and conditioner were my first foray into using liquid black soap products on my hair, and my scalp is in love. Here’s how I use it. 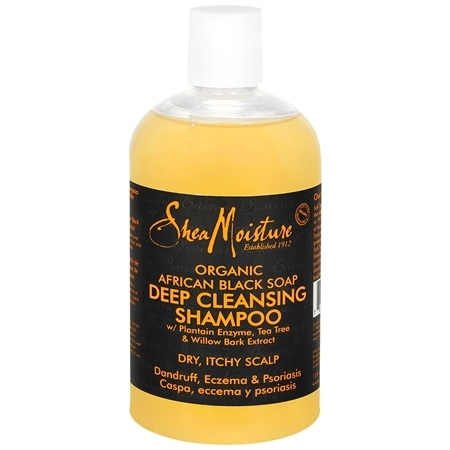 When my hair’s at it’s densest, sweatiest at the root, most ready for deep cleansing and love, I apply Shea Moisture Black Soap Deep Cleansing Shampoo and use the pads of my fingers to gently cleanse my scalp, parting through the impenetrable forest with a loving hand (and no fingernail use! I gave myself scabs from using my fingernails in the past. Don’t be like me). Felicia Leatherwood taught me, shampoo is for the scalp. Conditioner’s for the hair. So I use the shampoo and truly focus on cleansing my scalp and rinsing my hair clean, and then I saturate my hair with the conditioner and let the conditioner marinate while I attend to the rest of my shower. Then at the end, I start by detangling my ends with a wide tooth comb. Shea Moisture’s Black Soap conditioner doesn’t have the most slip of all the conditioners on the market — for extra slip, I sometimes add a little coconut oil. But it DOES make my hair feel supremely soft, it restores my curl pattern and diminishes frizz, and at the end my hair feels light, fluffy, and clean without being stripped of moisture. Follow up with a spritz of the dandruff and dry scalp elixir, use whatever styling product I’m in the mood for, and I’m good to go! Shea Moisture products retail for less than $10, and are available online and at Target and Walgreens! Get yourself some of this awesomeness, if you’ve got itchy, summertime scalp issues like I do! Have you tried Shea Moisture’s black soap products, or black soap in general? Tell me about your experiences and recommendations! I love the Shea Moisture Black Soap Bar. I got this item in a gift bag at the Curly Nikki Farewell Meetup in Raleigh, NC. Let me first say that this bar of soap is HUGE and seems like it will last forever. The scent isn’t my favorite, but otherwise, it’s tha bizness! It’s a nice firm bar, so no crumble-ation here! To keep it from getting all mushy, I store it on one of those soap pads with the raised nubs so it doesn’t sit in water (a breeding ground for bacteria). I use this soap on my acne-prone skin and it’s a gentle cleanser that breaks up oil, but not in a harsh, stripping way. Afterwards, my skin feels pleasantly taut and squeaky clean, but not overly dry. For me, it’s a keeper. Since April of this year, I have been using black soap as a body soap and shea butter as a body moisturizer. On my face I am a Mary Kay girl,but I need a little soap in my cleanser. So, I mix a little black soap with my Mary Kay cleanser. Let me just say I found the winning combination for both my body and my face! The hyperpigmentation areas on face and body are disappearing and my skin feels so soft! I think it’s time to see if my hair loves black soap as well. Thanks for the product review! I actually began using Black soap because of the black spots and discoloration on my face and back. My back is super sensitive so I needed a cleanser that wasn’t harsh with the chemicals and could get the job done. So I went and purchased the Ambi brand black soap. It worked but harshly. It made my skin burn and peel. So I wanted tot try something less powerful. Then I went to the local BSS and found an African Soap from a mom and pop company. It so works! Plus its twice the size of the ambi for almost a dollar more but it was under $5! So worth it for the results. Great minds think alike. I just was talking about this on my site. Glad I could be in the haps. I was strolling through Tarje aka Target when I saw it, tried it and gave it two thumbs up. Glad Target got competitive. Only thing Target needs to do now is stop labeling African American products as Coarse Hair Items lol….guess we can have it all! I have tried the black soap bodywash and the yellow shea moisture shampoo. They were both great. I absolutely love the Shea Moisture products! I’m a junkie for the Coconut and Hibiscus line. It just works! Had every intention of making a Target run today and hopefully can sample the Black Soap line. I tried the shampoo you featured above with the deep treatment masque (not part of the black soap line). Personally, I found that the consistency of the shampoo was a bit ‘off’ in that it was a runny liquid in the bottle, but became somewhat ‘gunky’ when it hit my wet scalp. To get the clean feeling that I wanted, I had to shampoo/massage/rinse twice–and when having to wash medium-length natural hair in sections, that the extra steps are just NOT an option for me. To be fair, though, my hair loves SheaMoisture’s coconut hibiscus line and I look forward to trying some of their other products. Bella, I think you did a youtube video about these products a while back, and on your recommendation I went to target and bought the shampoo and condish for my husband because his scalp was suffering through the rough Chicago winter. Well, he fell in LOVE! And, one day when I’d run out of my usual cowash, since this was in the shower, I tried it out, and I fell in LOVE! I love when we both love a product, and I love when a product has multiple uses. thanks for the recommendation, Bella. And, thanks for having such an awesome blog. You make me happy every morning that I read your posts. I just saw this in Target yesterday. Thanks for the confirmation that I should cop it next time I’m at Tar-jay, ‘Bella! I don’t use any of the Shea Moisture products but i do use raw African black soap. I have to say it’s one of the best things I’ve purchased in a very long time. I’ve go about 7-8lbs of soap in my house now and i use it for everything (facial cleanser, body cleanser, and shampoo). It’s super inexpensive and lasts for an incredibly long time. I’m also working on making my own skincare products, so i use a lot of “the butters” on my skin and love the results I’ve been seeing. I love shea butter. It helps my skin moisture and soft. 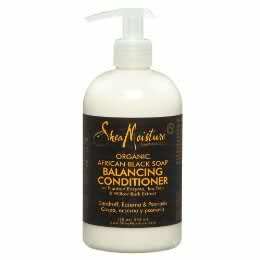 I love Shea Moisture its a staple in my household. I’ll have to try this line once Target arrives in Canada. I’ve tried black soap as a bath soap before. My skin was very moisturized afterward. I look forward to the hair care. Try Healing Herbs By Rene Products She Has some of the Best BLACK SOAP SHAMPOOS. Every weekend i used to go to see this website, as i wish for enjoyment, for the reason that this this web page conations genuinely pleasant funny data too. Pronounce You Chuck & Larry On-line Film Streaming Full. Watch I Now Pronounce You Chuck & Larry On the web Film Complete Streaming. people who just want to prepare a recipe that they have seen done by a celebrity chef on one of the ever popular cooking shows. know, many persons are searching around for this info, you could aid them greatly. New Yorker covering every inane feature possible. nnew stuff proper right here! Bestt of luck for the following! être installé avec tous les iOS et Android, qui comprennent mobile et tablette. ?????? ? 20 ??? ??? ??????? ? ??????????? ???? I absolutely love black soap and use it for pretty much my whole body. My skin and hair were very moisturized afterwards.